Chris and Susan live in Orewa, about 45 min North of Auckland. This little town sits atop a hill by a beach. Stunning views, and a nightly star show are the norm here. After our past ordeals, we are ready to relax and catch our breath. For Dan and Chris, scuba-talk is therapy. There should be a joke about 2 instructors in the same room, maybe something like: what can you say to 2 scuba instructors? Nothing. They'll do all the talking for you! Hee, hee. Its great to have Chris and Susan as our hosts, their knowledge of the country, area and scuba make us feel right at home! 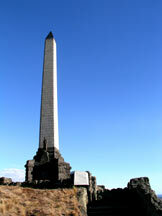 One Tree Hill: site of a memorial to the Maori by an early British Governor. Still known as One Tree, despite said tree being cut down by a Maori activist. It's a complicated situation.